Sometimes we need a warm bowl of soup – especially on these cold snowy days! 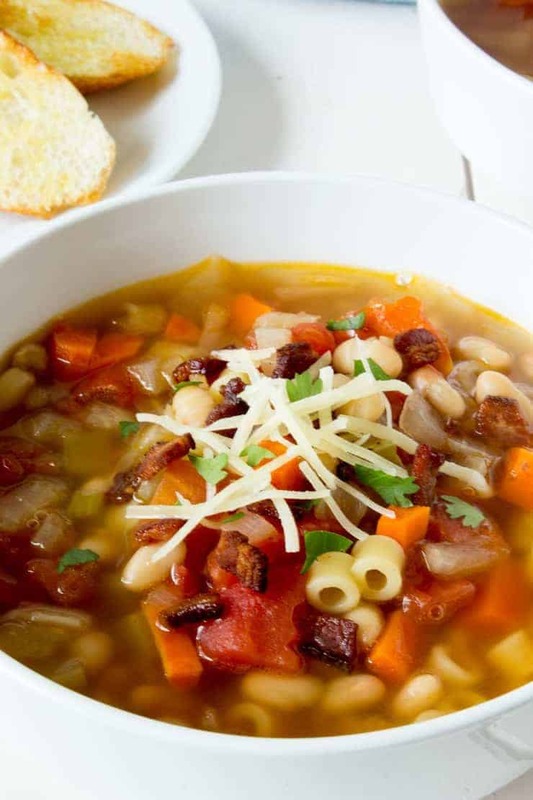 Pasta e Fagioli is an Italian soup with pasta and beans. This is a completely satisfying soup for lunch or dinner. 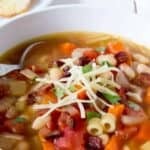 For this soup I used white beans, but you could also use kidney beans, garbanzo beans or really almost any kind of bean. The pasta is pretty flexible too. You just want a small sized pasta. I made a huge pot of this soup for dinner and then reheated the leftovers for lunch the next day. Totally delicious and satisfying for both meals. To make this soup, you start with bacon! Yes, bacon!!! The bacon is cooked crisp and then reserved for topping when serving. You use all that delicious bacon grease to saute the onions and garlic. It really sets the flavor up for an amazing soup. The most difficult part is not nibbling on all those cooked crunchy bacon bits! 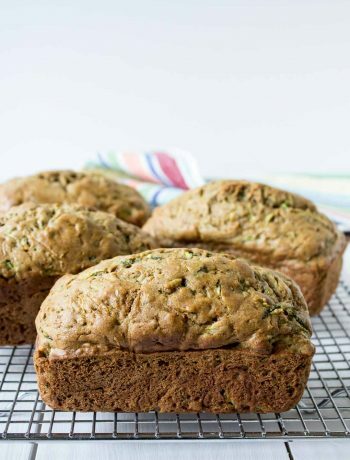 You may want to consider cooking an extra piece just for nibbling! Cut bacon into small bits. Cook in a large soup pot until crispy. Remove bacon with a slotted spoon and set aside. Keep bacon grease in pot. Add diced onion. Cook over medium heat until onion is soft. Add garlic and continue cooking for another 2 minutes. Add one cup of chicken broth. Stir and try to stir all brown bits on bottom of pan into the broth. Add remaining broth. Add carrots and celery and can of tomatoes with juice. Drain and rinse beans. Add to pot. Add salt, pepper and bay leaf. Bring to a simmer and cook over low heat for 30-40 minutes until carrots are cooked through. Add pasta. Continue simmering for 8-10 minutes until pasta is cooked through. Taste soup and add additional salt and pepper as needed. Remove bay leaf. Dish up soup and sprinkle on a small amount of Parmesan cheese, bacon bits and fresh parsley. Lovely! This is so much my kind of food! It’s raining here after a few scorching weeks and this is the time for soup. I hope you enjoy it! Stay dry out there! Love this hearty soup Kathy! 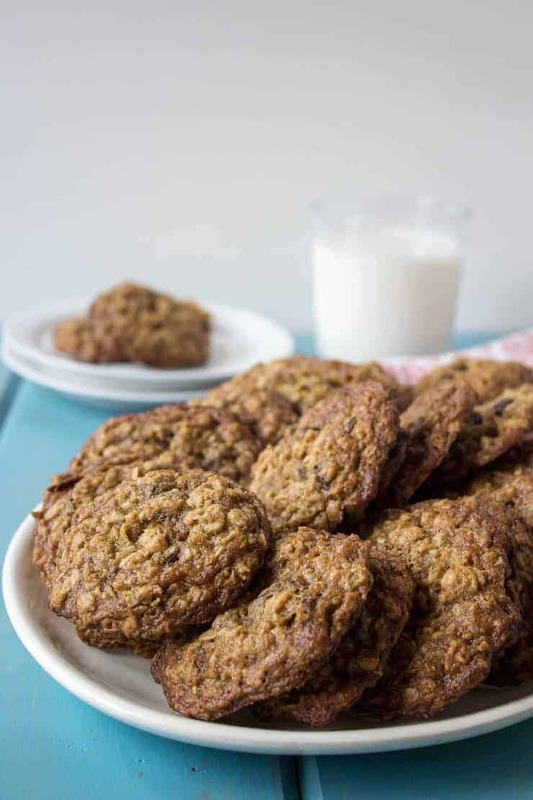 Filled with delicious , healthy ingredients to keep me satisfied for hours! Happy New Year. So excited to see what you’ll be sharing in 2018! 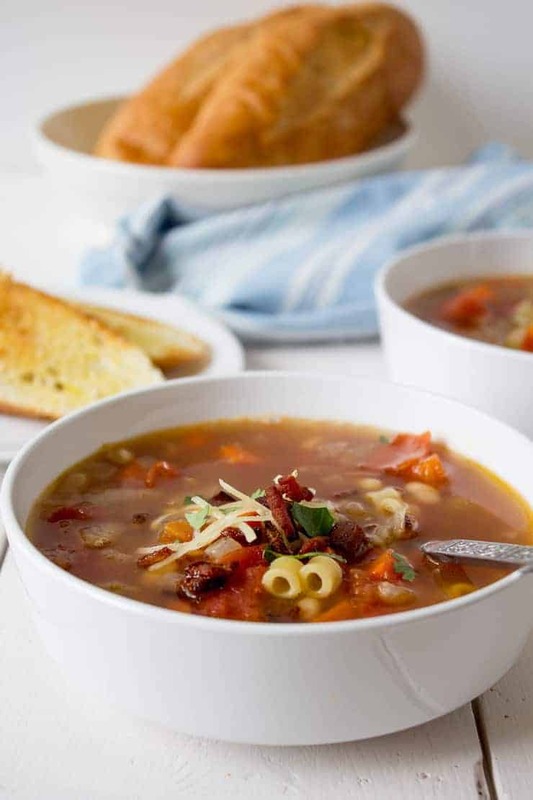 This soup looks so hearty and comforting….I absolutely love it for a cold day dinner. The cold days are here so I guess that means more soup! I love soup season and all the cozy, comfort it brings! 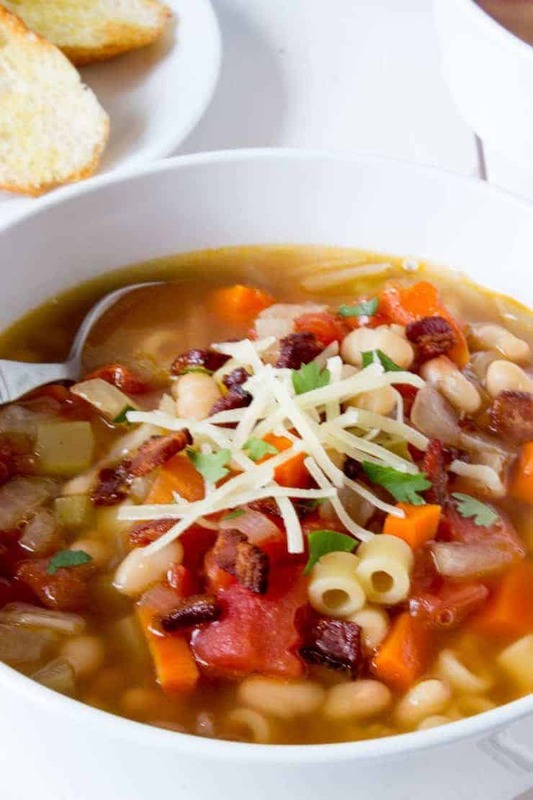 This one looks delicious and sounds like a hearty meal with all the beans, pasta and bacon! Yum! Happy 2018! 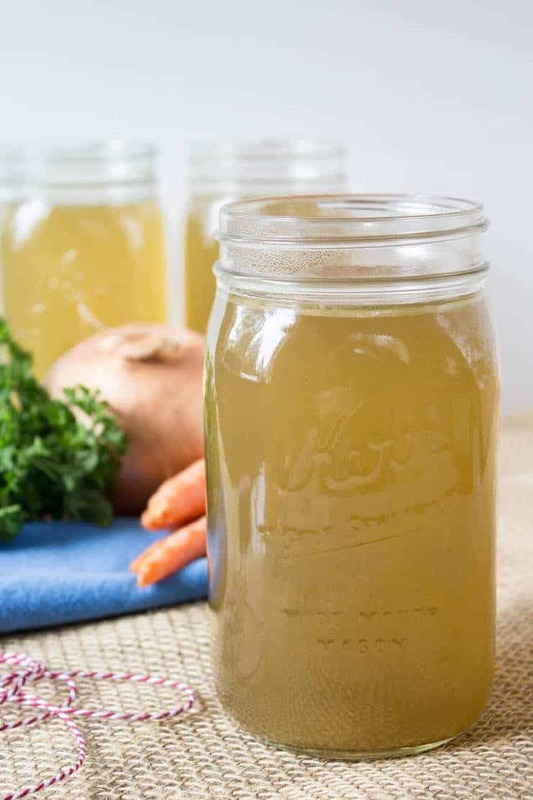 This soup makes a delicious meal! Stay warm!!! 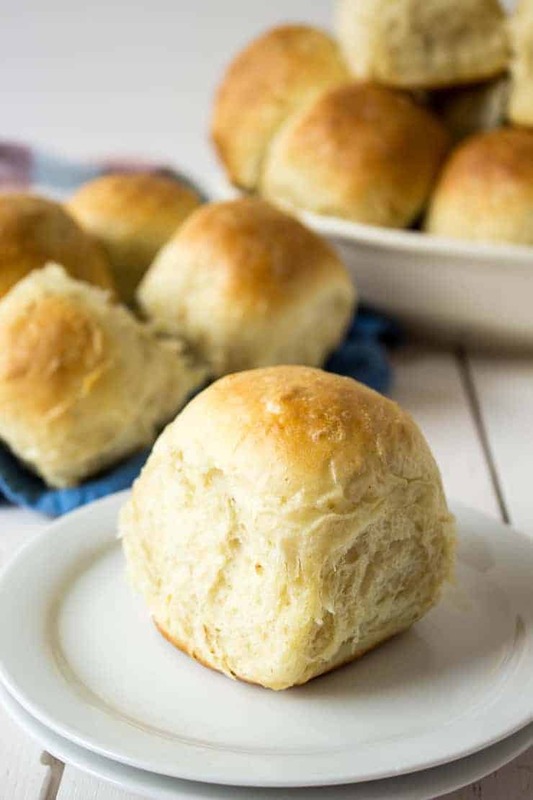 This recipe speaks to my soul! And anything with bacon certainly gets my vote! Happy New Year, my friend! A little bacon always makes things better! 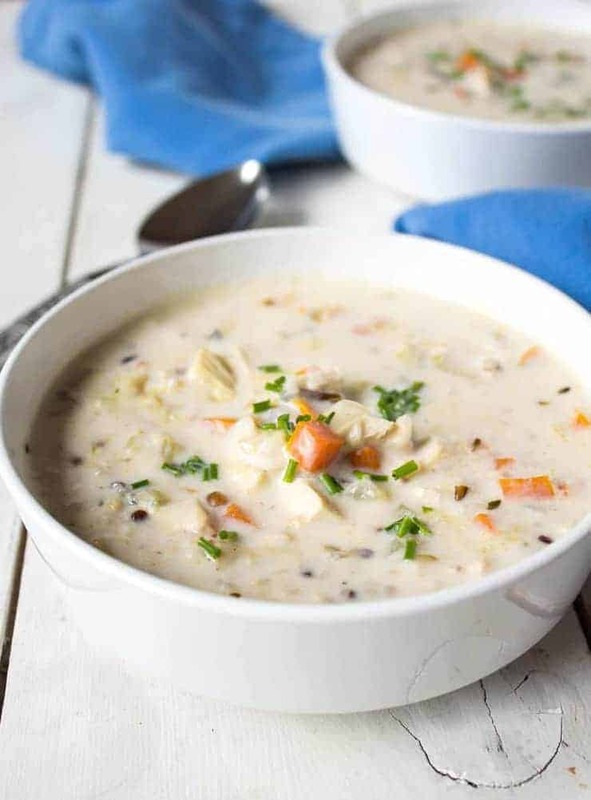 This is a perfect soup for the weather you’ve been having! Stay warm!!! This is one of my go to meals when I don’t want to make a trip to the grocery store as I usually have everything needed. I like the idea of the crispy bacon topping. You’ve got to try it with the bacon! It is a perfect addition! How did you know this is what I need today 😉 ? This looks so com forting and warm!! Perfect after the holiday to. Happy New Year! Take care. A nice bowl of soup is perfect just about any day! Enjoy! 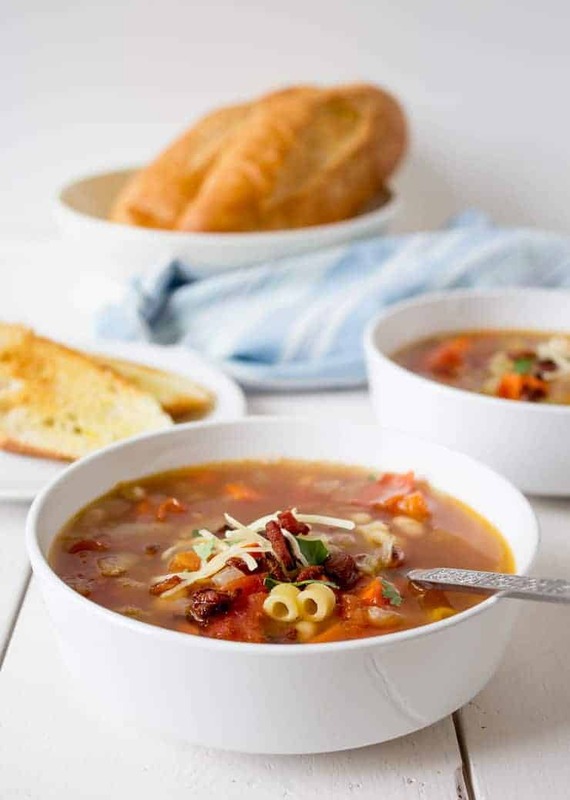 Pasta fagioli is such a classic soup, Kathy! Laura is part-Italian, so this one ranks up there pretty high in our book…although I’m not sure I’ve ever made a homemade version. 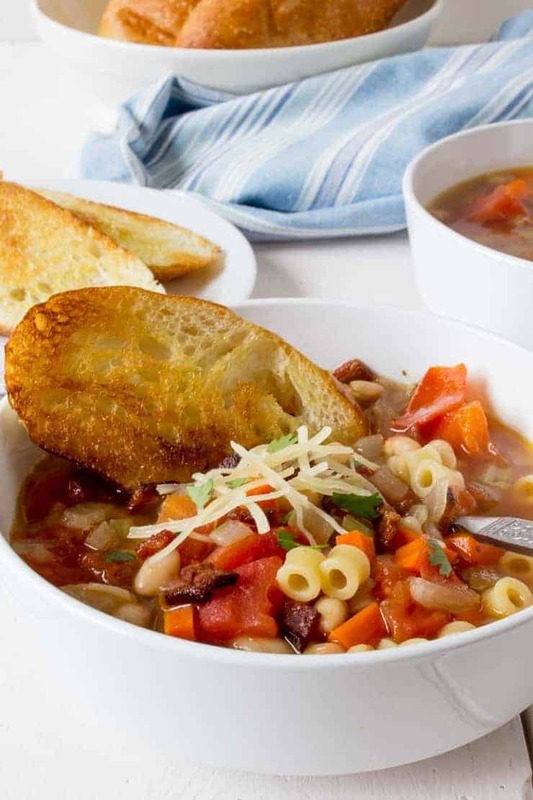 We’re heading into serious soup season here, and I’m thinking pasta fagioli might need to appear on the menu. Thank you for the inspiration, and stay warm, my friend!! Laura would be totally impressed if you made her this soup! Hope those storms are wrecking too much havoc for you! 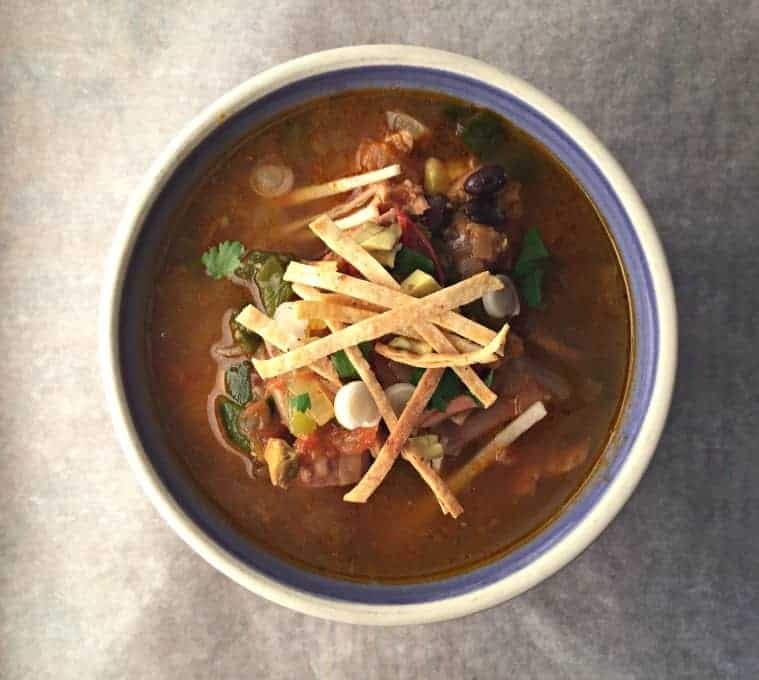 We’re having 80 degree weather here in San Diego, but this soup looks good enough to serve at anytime! Happy New Year to you! Oh how I wish for 80 degrees! We received more than 2 feet of snow the past few days! Today it is supposed to be nice and sunny – but still cold! 🙂 Happy New Year! 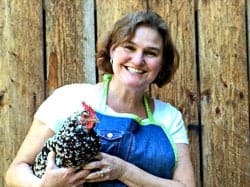 Copyright 2018 Beyond the Chicken Coop - All Rights Reserved.